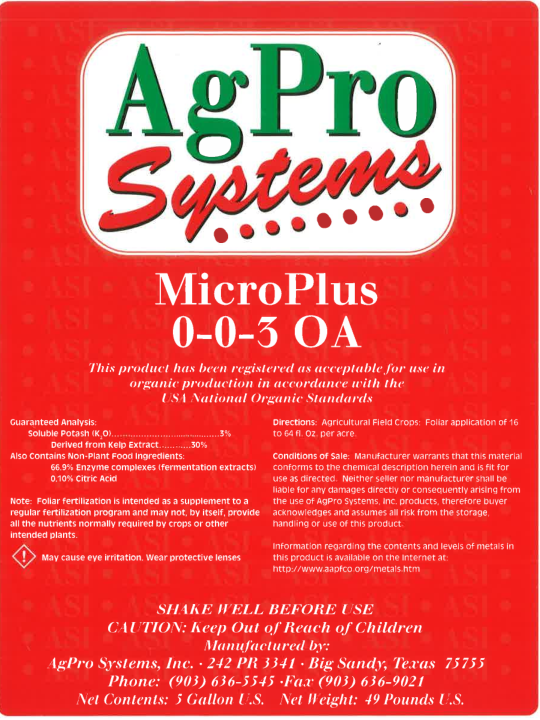 MICROPLUS OA™ (previously known as MicroPlex) is one of AgPro’s™ most diversely used products. It is a foliar plant stimulant designed to increase carbohydrate levels within a plant, push plant growth, aid in crop reproductive set, improve plant health, increase efficiency of foliar nutrient programs and reduce plant stress. MICROPLUS OA™ is a micronutrient foliar fertilizer. It contains a combination of selected strains of kelp, growth stimulants and contains specific ratios of vital trace minerals. MICROPLUS OA’s greatest value lies in its rapid absorption and utilization by plant tissue. This rapidly improves crops and makes them more resistant to pests and diseases. Typical benefits of MICROPLUS OA are enhanced crop quality and yield and faster plant recovery from stress. While similar to FOLIARPLEX, it contains greater amounts of the same minerals and growth factors. MICROPLUS OA is compatible with most other foliar fertilizer programs although many use it by itself to increase yield. Use one pint to one quart per acre with 5 to 10 gallons of water. We recommend the use of AgPro’s™ superior SPREADER STICKER with this product. AgPro™ MICROPLUS OA can be sprayed on various crops by itself or in conjunction with foliar nutrients, pesticides, herbicides or fungicides. MICROPLUS OA is an effective foliar crop treatment anytime a plant is under stress from disease pressure or weather factors (i.e. wind, hail, frost, heat). MICROPLUS OA has plant healing properties that increase the plants carbohydrate levels that aid in the healing process. At the same time, MICROPLUS’ plant stimulants push crop growth. MICROPLUS OA is a terrific crop (set) product, as well, especially when used with foliar nutrient programs (phosphorus, manganese, zinc, etc.) at specific reproductive stages. This product is helpful in disease and insect suppression due to its ability to improve the overall health of crops. Typical benefits of MICROPLUS OA are enhanced crop quality and yield, and faster plant recovery from stress. It is recommended to use AgPro’s SPREADER STICKER with this product. Use one pint to one acre with 5 to 10 gallons of water. NOTE: Due to the carrageen in this product there will be settling in the container. Shake very well. This product is completely soluble. 1-2 fluid ounces per 1,000 square feet. Add MicroPlus and mix with normal agitation.